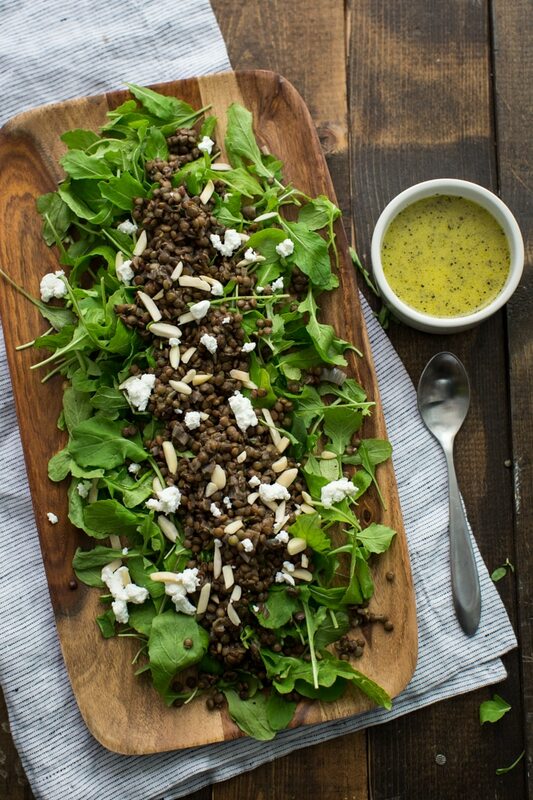 Arugula Lentil Salad | Naturally. I get in food ruts fairly easily, particularly with items we make day in and day out. Our evening dinner salads are often a simple dressed lettuce and whatever vegetables we may have on hand. My lunch salads are often heartier and more often then not contain chickpeas or black beans. Lentils are usually the farthest from my salad. However, they do make for a nice switch-up among the legume group. 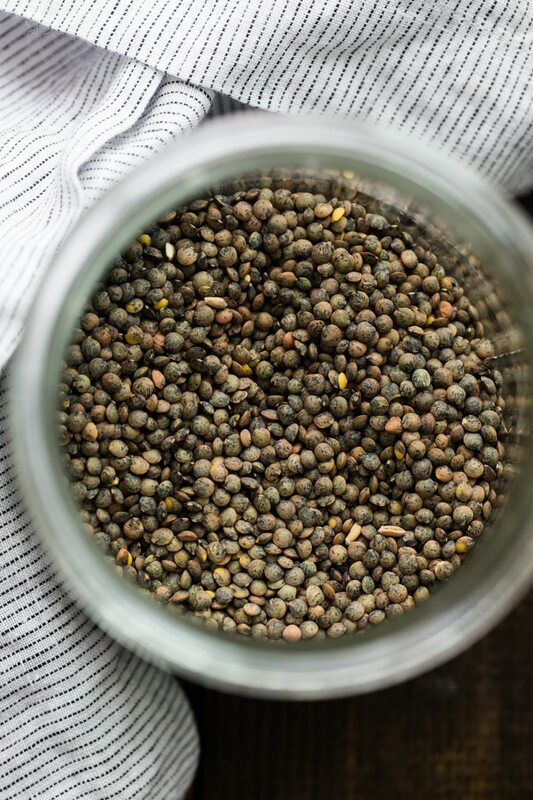 For this job, I use Puy lentils because they have their own flavor profile which adds nicely to the overall salad and they hold their shape well (don’t even think about using red lentils for a salad.) It may not look as pretty as when one uses chickpeas, but it’s a nice variation. I also keep the herbs to a minimum in the lentils, letting the spring onions really shine but I’d recommend tossing in whatever fresh herbs you might have on hand such as parsley, rosemary, or basil! In a pot, bring 1 1/4 cups water to a boil. Add lentils, spring onions, salt, and pepper. Reduce heat and let simmer until lentils are tender and water has been absorbed, 22 to 25 minutes. If lentils are not tender but water has been absorbed, add 1/4 cup of water and continue to cook. When lentils are done, stir in fresh marjoram. 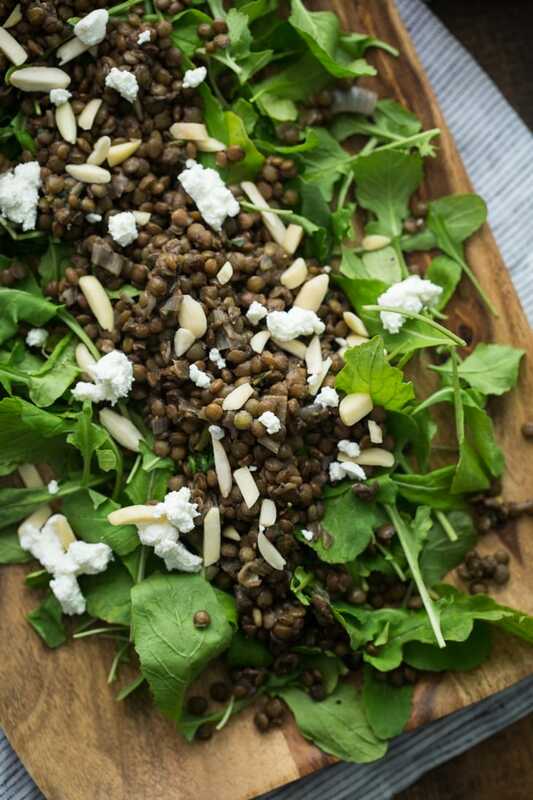 Place arugula on a platter or in a bowl and sprinkle with cooked lentils, goat cheese, and almonds. In a jar with a tight-fighting lid, shake together ingredients for the dressing and pour over salad to serve. simple and amazing 🙂 it looks delicious! This looks nice – definitely need to make this in prep for the summer body ! 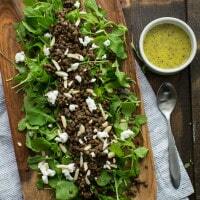 I adore Puy lentils and arugula so this is easily my new favorite salad. I love the simple flavors and how the ingredients speak for themselves. Beautiful! So delicious! This kind of complete meal salad is my favorite — simple and tasty. 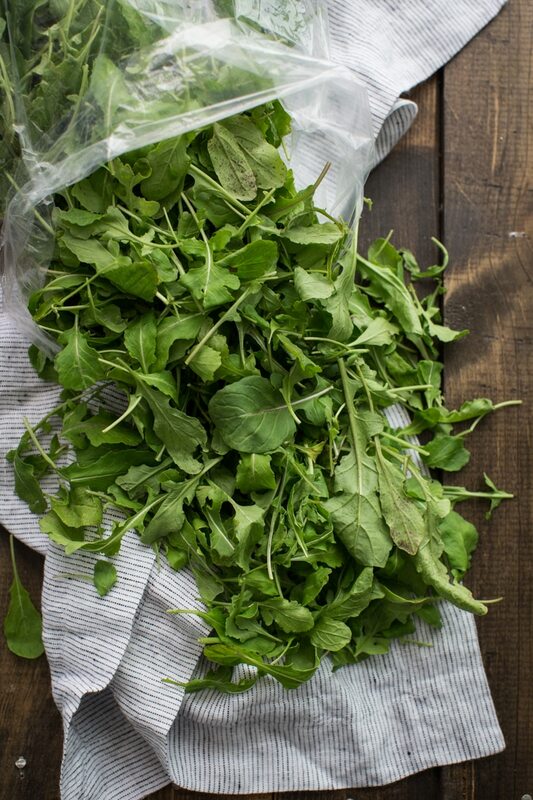 I love arugula (we call it rocket here in Australia) and this salad looks delicious. I’m thinking it would be a perfect weekday lunch…simple yet hearty! Lentils are one of my favourite meal staples. As a vegetarian myself I love adding them to meals! This salad looks so simple and delicious! Definitely saving it for later! Looks great. And I really like the wooden serving platter! The salad looks amazing. I can’t wait to try it. is there a way to remove the side sharing bar? i really want to read your content but that bar keep blocking everything. sorry…didnt mean to be rude but i am having difficulties reading about these wonderful lentils. This looks awesome! I love your pics and totally agree – I often get in ruts and an easy salad is just the right option to keep dinner healthy, delicious, and quick! Thanks for the inspiration. That salad looks so fresh! Very simple yet still very yummy! I love it! I came across a container of arugula for a price I couldn’t pass up. My husband and I are watching our weight and–it is Monday (Meatless Monday). This was a fantastic light dinner. It made 2 large servings and enough for 1 lunch tomorrow. I claim it!! Really great recipe. Thanks for sharing! Made it again–this time I didn’t have goat cheese, but had bluecheese crumbles. Wasn’t sure how it would go with the lemon juice and all, but it was delicious! Thanks for a great recipe, Erin!